Pattison and Harvill, who collaborated on Wisdom, the Midway Albatross, return with another real-life animal survival story. This one focuses on a puma cub, born in Brazil in 2012, who was orphaned after his mother was captured by a local chicken farmer. 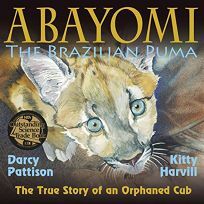 Pattison briefly discusses the problems that human development poses for Brazil's pumas before moving on to the cub, named Abayomi ("happy meeting") by his rescuers. The writing alternates between poetic moments ("How does a puma cub survive without his mother? He must hunt") and reportorial passages, including an account of how Abayomi's mother was captured, which bogs down with extraneous detail ("Suddenly, at 2:15 a.m., on November 27, she was caught in the chicken coop trap"). Tense changes distract, and Abayomi's story ends inconclusively, drawing murky parallels between the invisibility of wild pumas to humans and scientists' need to remain out of sight while caring for the cub. Harvill's muted, realistic portraits of Brazilian fauna and flora give a strong sense of the pumas' threatened natural habitat. Endnotes provide addition information and resources. Ages 6–12.